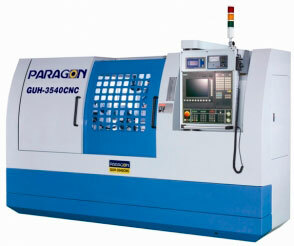 The new generation CNC universal cylindrical grinding machine (Heavy-Duty) GUH CNC Series by PARAGON is especially designed for high-speed grinding, offering greater capabilities than the GU CNC Series. This innovative designed machine with optimal and sturdy components can provide long service life and less down time, will bring you a new grinding experience. X-axis and Z-axis greater span of guideways afford larger load capacity than GU CNC Series. Time-saving and high efficiency in cycle and setup. The machine can accommodate an extra large grinding wheel with 610 mm diameter and 160 mm width which can complete multi-steps machining at one time, greatly shortening operation time and assuring high rigidity and precision. Z-Axis class C1 ballscrew is temperature controlled by circulating coolant achieving minimum thermal displacement effect and greater accuracy. Rigid and precise hydrostatic-hydrodynamic hybrid bearings on angular wheelhead.